2017 is off to a great start at the Corral! Here are a few highlights of our first quarter that would not be possible without our “herd” of supporters! We wrote for and obtained a grant from Helpful Hands Inc, to provide 10 individual scholarships to at risk youth living in Seminole County. Each recipient will receive 6 sessions of our Equine Assisted Learning (EAL) Life Skill work, free of charge to their family. We were also granted funding to begin two at risk youth groups who will also receive 6 group sessions free of charge. Sessions have begun and we are still sending out applications. One of our incredible therapists, Kathy Wilkes, LMFT has much experience working with traumatic loss, bereavement and also the stress of caregiving. This year, we opened our gates to Gold Star Families as well as began a Caregiver support, Equine Assisted Psychotherapy (EAP) group as part of our veteran/military program. In February, two more Equine Specialists and another Licensed Mental Health Counselor were officially certified by the O.K Corral Series to help us with meeting the needs for our work in the community. We kicked the year off with the addition of a new board member, Rebecca Peeples. Rebecca is a CPA with 25 years of experience and is passionate about serving others and loves the outdoors. We are excited to have her on board to help us with our financials and more! Our Therapy program has grown tremendously in this first quarter! The year is off to a great start, our therapy team and clients served has grown tremendously in the last three months! 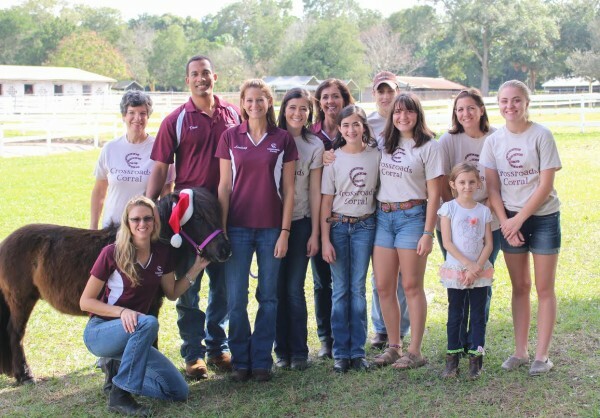 We appreciate your continued support as we follow our mission to promote personal growth, hope and healing through horses and serve Central Florida! Our team has experience working with youth who are involved in the Department of Juvenile Justice system as well as youth who are “at risk” of offending and becoming involved in the DJJ. We also work with youth who are having trouble in school or struggling with behavioral outbursts at home. No matter the background of the client, when they walk through our gates, they are stepping into an unfamiliar world that is peaceful, nurturing, judgement free, but can also be scary. This allows for our clients to grow in a way that can only happen when they are outside of their comfort zone. 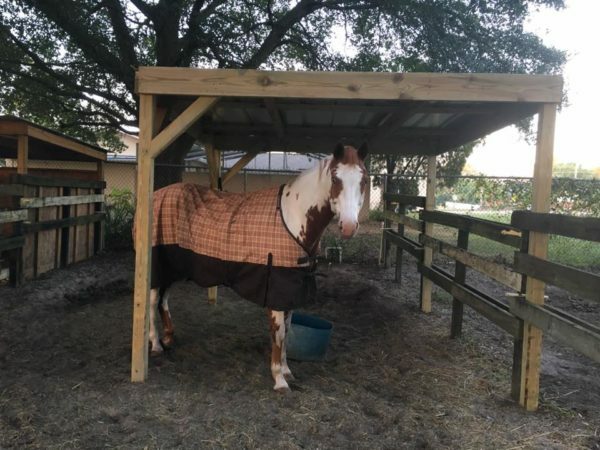 -The sheer size of the horses often cause clients to take a respectful step back, even those who have behavioral outbursts will often contain them in the presence of a horse. 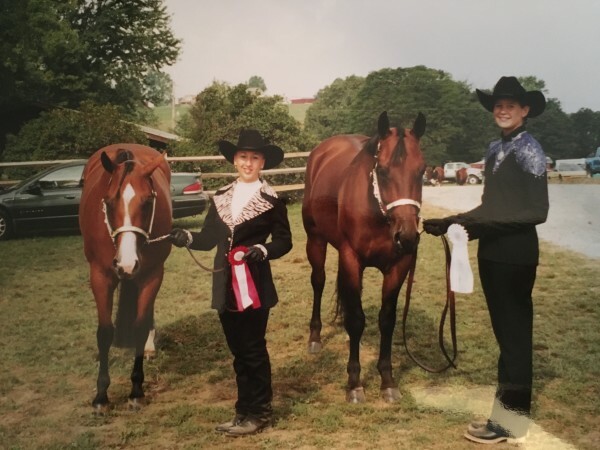 -When youth come to our farm, they are presented with unpredictable, unscripted scenarios in which they have no previous experience ( most clients have no horse experience). The skills that clients use to accomplish tasks are actually being practiced and adapted in the moment. Mastering problem solving skills in a setting like ours helps to strengthen a clients’ self-confidence as they complete tasks initially thought to be beyond their ability. (Example- catching and placing the halter on a horse with minimal instructions, getting a horse to go over an obstacle without touching them in any way). -One of the most unique aspects of Equine Assisted work is that horses offer immediate feedback and reactions to behaviors presented to them. Clients who impulsively jump into a situation without thinking of possible consequences will likely see some immediate effect displayed by the horse. We see this commonly in youth but horses teach youth to take a step back, think and problem solve before jumping into a situation. How important is that lesson for everyday life? -Youth learn quickly to say what they think their parent, therapist or probation officer wants them to say. In our work, we are not focused on the verbal communication, we are focused on the non-verbal. This is so powerful because it is really hard to “fake” non-verbal communication! -We also frequently discuss utilizing resources for help during our sessions. With almost all of the activities, we have resources available for the client to use. Some clients utilize resources right away, others never ask for help or utilize any other tools but themselves. This gives us great information that we can discuss with them. -We also have to mention the bond that develops between the horses and clients. The horses have an incredible way of showing attention and love to those who need it, exactly when they need it. 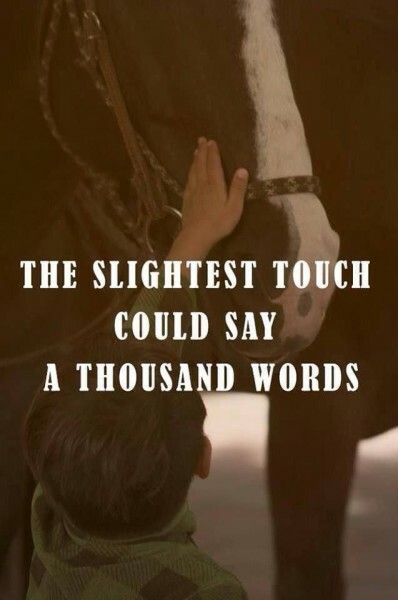 We have seen our horses give clients “horse hugs” when they are sharing an experience that is hard for them to talk about. I am a big fan of the book, “The Tipping Point” by Malcom Gladwell. He discusses the idea of behaviors having “stickiness”. Our work has the stickiness factor because our clients are often outside of their comfort zone, having an experience and self- discovering as compared to just merely listening and talking. They remember what they did, how they felt and the outcome of the situation which makes the lesson “stick” and leads to change. We are proud to serve at risk youth at our farm. We provide both Equine Assisted Learning opportunities which focus on life skills as well as Equine Assisted Psychotherapy (counseling) with our Licensed Mental Health Professionals. If you know of a youth who would benefit from our services, please contact us! When reflecting on 2016, which is only year two of our organization, one word comes to mind: THANKFUL. We are thankful to have a passionate board of directors, committed volunteers, loving and giving donors who believe in making a difference, the Foundations who believe in our mission and provided us with our first generous grants, community partners who believe that working together to serve creates a larger impact, clients who are willing to step outside of their comfort zone and trust our team, our incredible mental health professionals and equine specialists and last but certainly not least, our team of therapy horses who constantly provide our clients with exactly what they need and speak directly to their hearts. We were blessed to grow our team of licensed mental health professionals this year which means we can serve more clients in 2017! Meet our team here. Receiving a grant is a big deal, especially for a young organization! Because of our hard work and the impact our organization has made, we were granted funds from The Florida Blue Foundation, The Robert Irvine Foundation and the Lawrence E. White Family Foundation this year to further our mission! We grew our community partner network! We firmly believe that when organizations work together, we can make a greater impact and touch more lives. Meet our incredible community partners here. We were blessed by The Home Depot Foundation with a $5,000 grant to improve our facility on behalf of the veterans we serve. 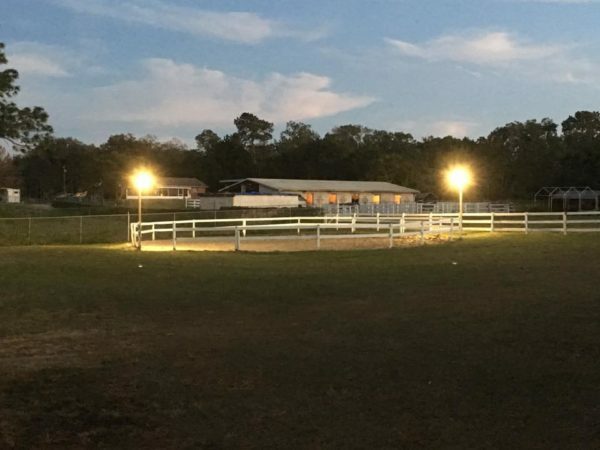 We hosted the service project on Veterans Day along side of HBI and The Mission Continues and we received a completely renovated bathroom, 2 horse shelters, lights in our therapy ring, a big and beautiful flag pole, new lights and fans in our barn and rubber mats. This project would not have been a success without all of the organizations involved and we are eternally thankful! 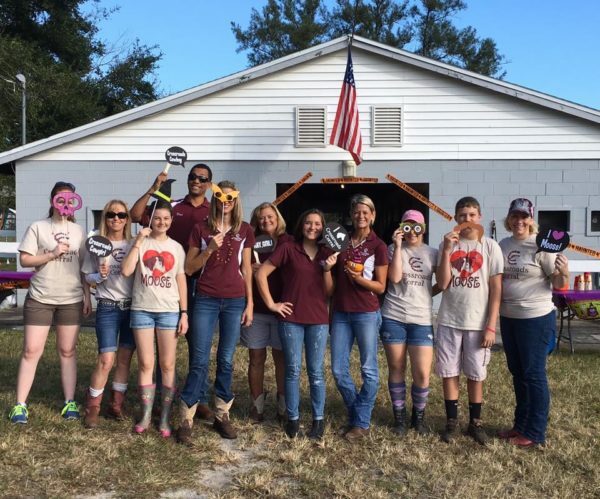 We hosted some great family fun days on the farm with BASE CAMP Childrens’s Cancer Foundation, The Mission Continues, Wounded Warrior Project and The Seminole County Sheriff’s Office who responded to the Pulse shooting tragedy. These days are meant to bring families together to have fun and make memories. It’s also a great way to educate others on our mission. We have several photo albums on our FB page! Our Crossroads volunteer family came together and donated our own money to bless military families and youth in need for Christmas. Among our group we raised enough money to bless 3 youth in foster care as well as 3 military families this year! As an organization, we grew by 74.2% this year! There is still time to make those end of the year contributions! We ensure that your donation directly impacts our clients in need. As always, donations are tax deductible and you will be provided with a receipt. We also have an Amazon-wish-list-CRC if you would like to contribute something of need to our program. We appreciate your support more than you can ever know and hope you will join us in celebrating a wonderful year and all of the lives touched. Bring on 2017! We are more motivated than ever to serve our clients and our community. This Veterans Day was one that will be cherished forever. 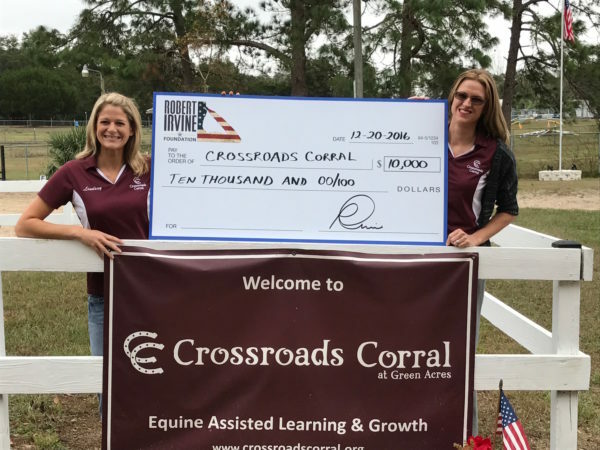 We had the honor of working a long side of incredible veterans in our community as well as The Home Depot Foundation/Team Depot, Home Builders Institute (HBI), Eckerd Kids Project Bridge and The Mission Continues to complete a service project on our farm called, “Operation Equine Uplift”. This project was funded by the Home Depot Foundation/Team Depot and we received a generous $5,000 grant to greatly enhance our facility on behalf of the veterans we serve! This project would not have been possible without all organizations involved! 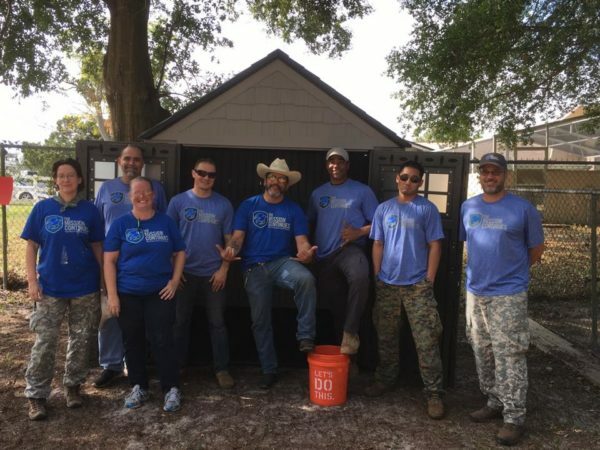 A huge shout out goes to Melissa Geiwitz of HBI, Melvin Guzman of Eckerd Kids Project Bridge, Louie Morales of Home Depot as well as Daniel Kalagian of the Mission Continues Orlando 1st Platoon. A huge THANK YOU to all of our veterans and youth of Eckerd Kids project Bridge who came out and worked so hard to improve our property! Not a day goes by that you are not thought of in appreciation! On this Thanksgiving and every day, we are so incredibly thankful for our volunteers. 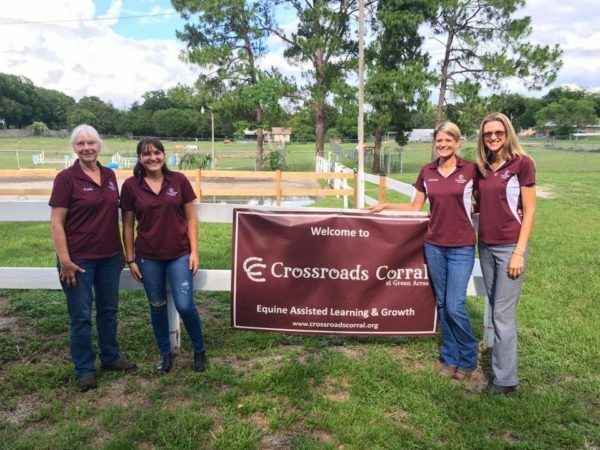 Our volunteers are the backbone of our organization and we could not fulfill our mission without the wonderful people who are part of our Crossroads Corral herd. Currently, our organization is entirely volunteer run. This means, 7 days a week, twice a day, we have volunteers who care for our horses. This work isn’t glamorous but it sure is fulfilling! We clean stalls/paddocks, feed, hay and water twice a day as well as turn the horses out in the field for exercise. They also help us to groom our horses and they are always willing to show them some extra love. We also have some great “farm Dads” who fix the fence, help us to take care of our equipment and can build just about anything. Our volunteers don’t mind the physical work and everyone gets their hands dirty, literally. We are so incredibly thankful to our mental health counselor, Kathy who volunteers her time at our farm to see therapy clients. Since March, we have provided 56 counseling sessions free of charge because of Kathy’s willingness to volunteer! 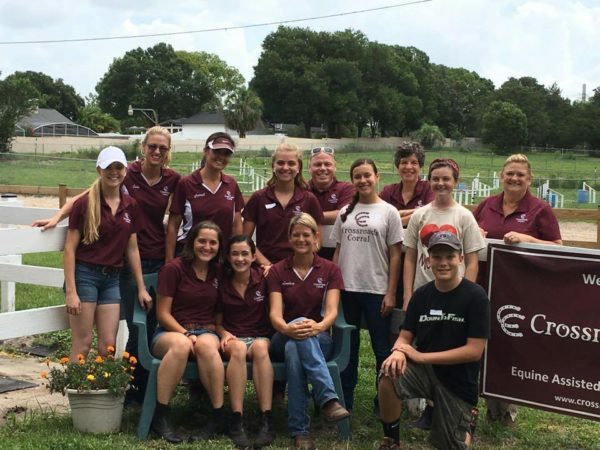 Our certified equine specialists that work alongside of Kathy to see clients also currently volunteer their time. We are so excited to welcome another licensed counselor to our team this year, Tracy Weiss! As part of our program we host numerous events for our community that we could not do without the help of our volunteers. This year we have hosted family days on the farm for the Mission Continues, Wounded Warrior Project, BASE Camp Children’s Cancer Foundation and the Seminole County Sheriff’s Office. We offer these events free of charge and our volunteers help to make these days so special for the families that come. We also host fundraising events to benefit our program and our volunteers are integral in making those events a success! 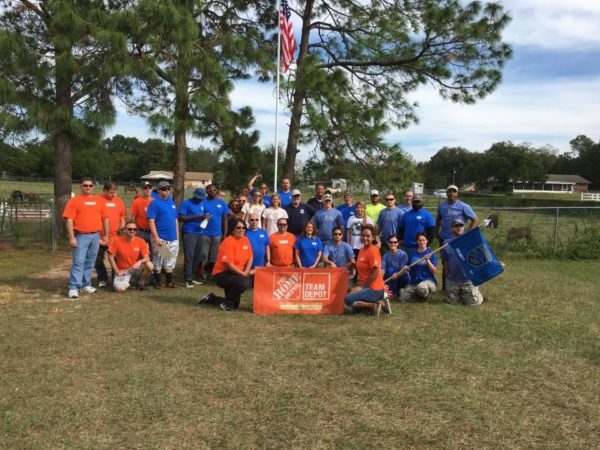 On this Veterans Day, we hosted a service project with The Mission Continues, HBI, Home Depot Foundation and Eckerd Kids-Project Bridge. I have never been surrounded by so many people who have such loving and giving hearts. We had about 60 people volunteering on the farm, working hard to improve our facility in honor of the veteran clients and families that we serve. The impact that they made left us in tears of joy! I must thank the incredible team at Brand Advance, a Creative Marketing Agency for volunteering their talented services for our website, T-Shirt designs, and marketing materials! This agency has made a huge impact for our organization. Last but certainly not least, when it comes to our volunteers I must thank our dynamic Board of Directors. Our Board of Directors have full time jobs, families and obligations but they are always there to support our organization and the community we serve. They are helping to guide and lead this organization so that we can be here to fulfill our mission of promoting personal growth, hope and healing through horses for many, many years to come! Some may wonder, how can horses really help people? 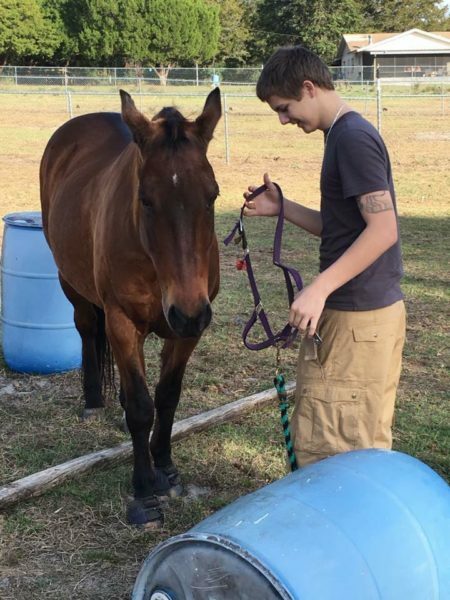 When our clients participate in either our Equine Assisted Learning model or Equine Assisted Psychotherapy model, they are stepping outside of their comfort zone and having experiences with the horses and our team that teach them about themselves and life. Have you heard the quote, “a comfort zone is a beautiful place but nothing grows there”? We see this time and time again and it is a beautiful thing when a person moves in the direction away from their comfort zone and their personal growth happens right before our eyes. We are certified to conduct life skill individual and group sessions (60-90 minutes) as well as workshops (up to 3 hours). These sessions work great for youth as well as for individuals who may be just a bit lost on their life path. Most of our clients for EAL have not suffered much trauma in their lives but need help learning important life skills that will make them grow and thrive. We focus on the following areas and always curtail our sessions to the individual client(s) needs. I’ll share a simple example of a session with the goal of improving communication and leadership skills with a group of youth (3-4 kids per group). We would have 4 horses out in a field with no halters on. We would ask the group (of 3-4 kids) to choose a horse after observing them for a while. Once they all agreed on the horse to use, we would ask them why they chose that particular horse. We know our horses so well so it is always interesting to hear their perceptions about the horses. Their perception also typically gives us info about them as well. After that, we would hand them the halter and lead rope and ask them to catch their horse and lead it over to us. They always look at us and say, “wait, I don’t know how to do that”. Our response is always the same, “just try a few things and if it works for your group and the horse, it works for us”. In our work, there is no wrong or right way (much different from teaching traditional horsemanship). Our team is there to step in if safety is a factor. Right away, we see who is taking the lead by who is the most vocal about the horse choice and who reaches for the halter. We watch how they approach the horse (non-verbal communication) and how they work together in a group to catch the horse (creative thinking and problem solving). You see who steps up and who falls back. You see who stands behind the horse and seems unaware of their own safety (our team is watching). You see who is loud and aggressive on the approach verse who is calm, quiet and respectful. Sometimes the horses stand there to be caught and sometimes they walk away and make it more challenging. Very often a horse will move away from a lot of pressure and people are the same, this is something we discuss. If the group runs towards the horse, the horse is going to startle and run away. We discuss the importance of relationship building and how much non- verbal communication plays into that. We are able to point out body language the kids portray to the horse that is most often the same body language that is portrayed to other people. Once the horse is caught, how do they get it to move? What kinds of cues and body language do they portray to the horse to ask it to move, with ASK being a keyword. Horses make you earn their respect before they will go a long with you. Aren’t people the same? With horses we have a stop zone, relationship zone and friend zone. With people we have the same zones, but it is easier to point out with a 1,200 pound animal. The sense of accomplishment that follows these sessions is overwhelming. The coolest part is that through the experience, they have taught themselves which is very different from traditional teaching. That is what makes our work “stick” with our clients because they are teaching themselves with a little guidance from our team and 4 legged friends. 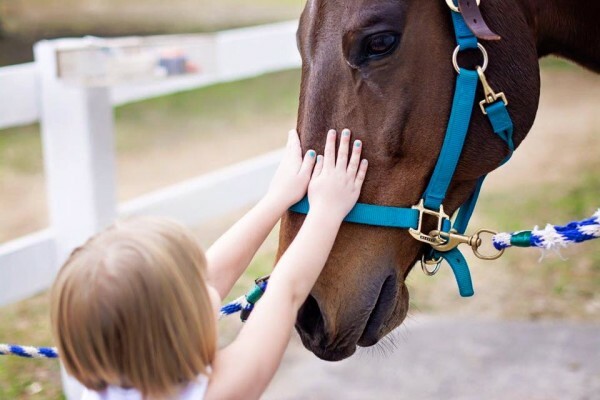 For those who have suffered trauma in their lives and are currently in counseling or if counseling has not worked for them in the past, we offer Equine Assisted Psychotherapy (don’t let this big word be scary, it just means counseling). For this model, our team of Equine specialists works a long side of a licensed mental health counselor (60-90 minutes). We can work with individuals or a family unit. At our farm we are currently working with veterans who suffer from PTSD, women and youth who have suffered trauma/abuse. Below is an sample example of what a session may look like. Typically, we get that “deer in the headlight” look and get asked a bunch of questions but we provide the same answer as I stated above, “just try a few things, our equine specialists are here to ensure safety and will step in if needed”. Do they try the same thing over and over again that is clearly not working? Do they do some really awesome problem solving or get angry? How do they effectively non verbally communicate with the horse? I could literally go on and on about how impactful this activity is and the success stories we have had at our farm with our clients. This work changes lives. 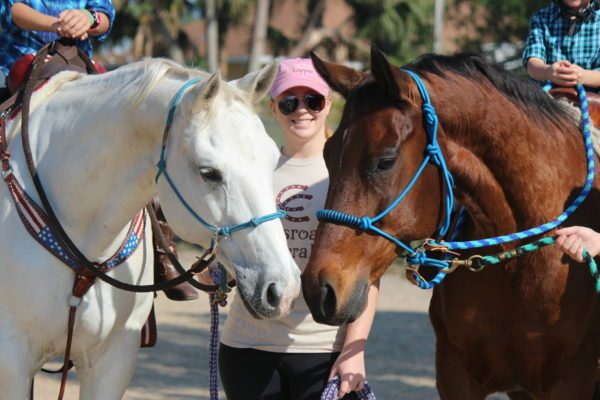 Our mission is to promote personal growth, hope and healing through horses. If you know of anyone who is in need of our services, we would love to have them become part of our herd. 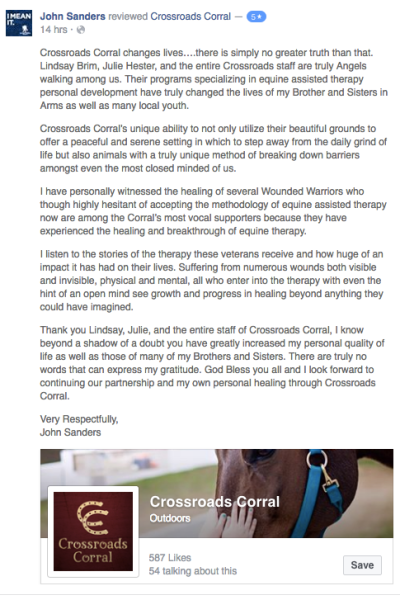 At Crossroads Corral we are extremely passionate about giving to others and helping them to heal and grow through horses. We have been blessed with wonderful volunteers and clients who have walked through our gates and into our hearts. Please take a look at what people are saying about our organization. In order to take riding lessons as a 9-year-old girl, I had to do the barn chores. As a young girl I learned about being accountable, reliable and responsible because of this. I would feed, turn horses out, clean stalls, and even break ice out of the water buckets in the freezing winter months of PA. The thing was, I loved every second of it and that work as a young girl made me a better person and a great employee. I am extremely reliable, not afraid to get my hands dirty (literally and figuratively), work hard, stay on task, manage others and enjoy having great responsibilities. Horses are extremely intelligent beings and they are great at pushing boundaries to see what they can get away with. Due to the fact that I have spent over 20 years of my life working with numerous horses of all ages I have had to learn patience. I have owned horses who didn’t want to get on the horse trailer, stand quietly for the vet or farrier, allow me to catch them in the field, fight with me over a new training technique, not want to walk over a tiny mud puddle on trail, etc. 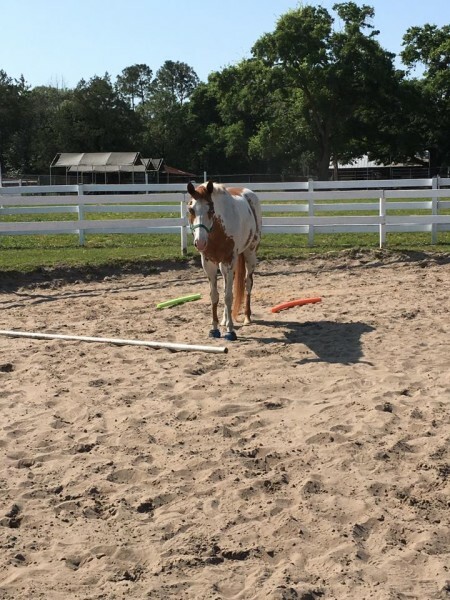 When it comes to training horses, there is a lot of repetition and you need to have patience and set your emotions aside to accomplish the task. In high school I rescued a 6-month-old filly (Roxy) and it took me over a week just to be able to enter the stall and touch her without her trying to kick me. This quality has carried over into my every day life when it comes to working with and dealing with people. Because I have practiced patience for so long with horses, it comes easily when working with humans too. One of my favorite quotes states, “You don’t know teamwork until your partner is a 1200lb free spirit”. This is so very true. There is nothing like working together with a horse and being on the same page. You have to learn to speak their language and if they don’t understand what you want, you are most likely giving them mixed signals. The same is true for humans. We are all different and we think, learn, communicate, love, teach and feel differently. We have to learn to work together in this world despite our differences. Horses have triggers just as humans due so having a mutual respect and understanding for one another makes for a great team whether it’s the human- horse team or human-human team. 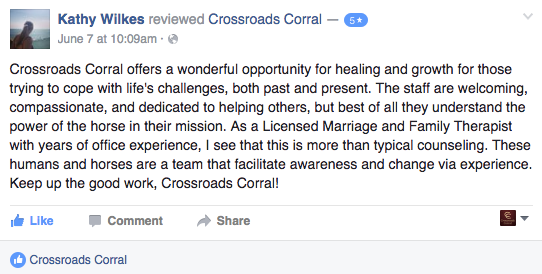 When you learn the value of teamwork and have a great team like we do at Crossroads Corral, anything is possible! There have been many times in my younger years where I picked a fight with a horse that I did not win. Luckily, I have never been seriously injured but I remember plenty of tears and letting frustration get the best of me. Remember, they weigh 1200lbs and are incredibly smart animals. When it comes to horses you need to learn when to pick your battle and when to quit. Sometimes the horse is in a mood and most often that is because of the humans mood. I have had many rides over the years that I became so frustrated with my horse for giving me attitude and not doing what I asked. Looking back, that horse was just displaying my cranky mood that I should have checked at the barn door before getting into the saddle. I learned to pick my battles when it came to horses and people. I would say that I am typically a non-confrontational person unless something is really bothering me. I don’t think confrontation is bad, in fact I think it can be really healthy, but there is a tact and a way to do it. I think I have learned this from dealing with horses. I have learned not to make a big deal out of something small. I also had to learn when to call it a day and quit. When you ride you should always “end on a good stride”. The same goes with people. When having a confrontation you should always end on a good note. I grew up showing horses and most of the time I competed against some of my best friends who were great riders. I am a competitive person in nature and yes I like to win but horse shows can and should teach you how to have great sportsmanship. Even if you don’t win in the pen, having a good ride is all that matters. 4-H really taught us how to respect one another, our horses and to always have sportsmanship to fellow riders. I am not speaking of all horse shows, some are extremely cut throat out there so I am only speaking on my experience with mostly 4-H. The value of sportsmanship carried over to the non-horse part of my life. I can truly be happy for others and celebrate with them in their successes. There will always be times in our lives where we want to compare ourselves or life situation to others but instead of being envious or jealous, we should celebrate others successes. Horses are herd animals and when they are in a herd they travel and navigate terrain according to the herd leader, which is most often a stallion. Domesticated horses are also looking for a leader when it comes to working with humans. If they do not respect you or trust you as a leader, they will not do as you ask. Because of horse’s size, you must be assertive but in a respectful way. Horses do not respond to being “pushed around” or “bullied” so you have to be creative in your assertive, yet respectful tactics. This is the same for humans and this is so important for kids to learn. Much like horses, humans don’t gain respect for others out of fear. Working with horses improves your creative thinking and problem solving skills which makes you a great leader. 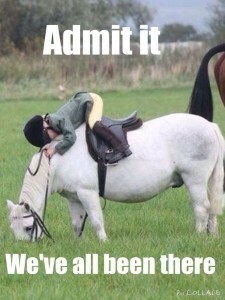 Everyone knows the saying, “If you fall of a horse, you have to get back on”. Even for seasoned equestrians, this can be hard, but most of us do it. I have personally fallen off and despite my fear, got back on and I have seen many others do the same. Horse back riding is a very dangerous sport. I have seen statistics that show over 100 deaths per year are related to equestrian related activities with over 25% resulting in head injuries. There will be so many times throughout our lives that we let fear take over but the fact is, “you have to get back on that horse”. For some just walking a horse or being in the close vicinity can cause fear. The sense of accomplishment is so great once that person works through those emotions. I believe having fear is healthy; it helps us to stay smart and make better decisions. I think being able to push ourselves through our fear is a remarkable trait. Horses are extremely intuitive in nature; this is one of their many God given gifts. They know when we are happy, sad, angry, anxious and scared sometimes before we even know. Horses will “mirror” or display our emotions for us, which makes them extremely powerful therapeutic animals. They teach us to control our emotions and show us how we present to the rest of the world through their body language and actions. They literally have the power to teach us about ourselves. Sometimes I won’t even realize I’m anxious or stressed about something until I’m working with one of my horses. Their body language gives me a clue to check in with my emotions. Being able to regulate our emotions is so important and horses can help you learn how to do that. Being able to work with horses has helped me greatly develop confidence and positive self-esteem. Horses help people build confidence in themselves naturally because of their size. Horses also help people with having a purpose and developing positive self-esteem. I have personally experienced this and I have seen great growth in youth and others at our farm from doing chores such as feeding, cleaning stalls and leading horses to pasture. We also focus on confidence building as part of our EAL program. Working with horses in the round pen is another area where I have seen confidence and positive self-esteem grow at our farm. Being able to non-verbally communicate with the horses is so powerful. One young girl who I have the pleasure of doing EAL with told me there were some bullies at her school. We began working on some leading activities with her favorite horse to build up her self-confidence. Last week she told me that she confronted the bully (in a healthy way) and now they are friends. She also told me that pretty soon she wouldn’t need my help to take care of the horses because she can do it on her own. She is 8 years old! The bond between horse and human is something that cannot be explained only felt. Because they are so intuitive and you build so much trust and respect for each other, the love felt is so strong. When I worked in medical sales I would come home from a stressful day, take off my dress and high heels and the moment I put on my jeans and cowboy boots, I felt immediate happiness. Another one of my favorite quotes is, “no matter how bad your day is, there is always someone waiting for you in the barn”. I have talked and cried to my horses and they have never shared my secrets with anyone. In moments of vulnerability, horses still make you feel loved. I don’t have to wear make up, nice clothes (sometimes I go in my PJs and cowboy boots) or have my hair done when I go to the barn. I can be myself even at my worst and always be accepted. That is unconditional love. Our team operates under the power of unconditional love. 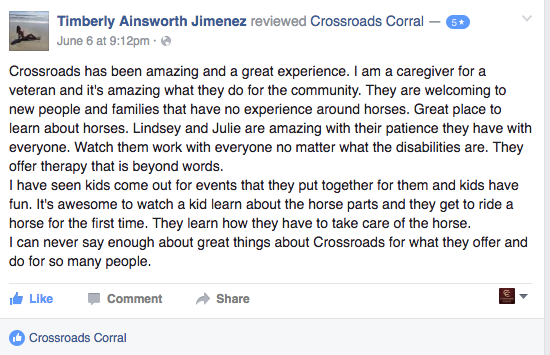 Julie and I started Crossroads Corral because we truly see our horses as gifts that should be shared with our community. 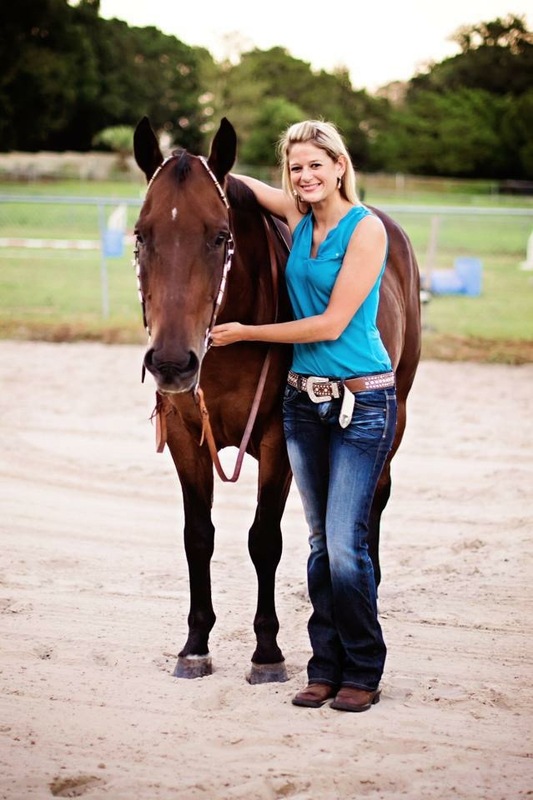 We are passionate about helping others through horses to develop the skills and fulfillment we have both obtained. You do not have to go out and buy a horse to experience these important life lessons and skills. That is where we come in! 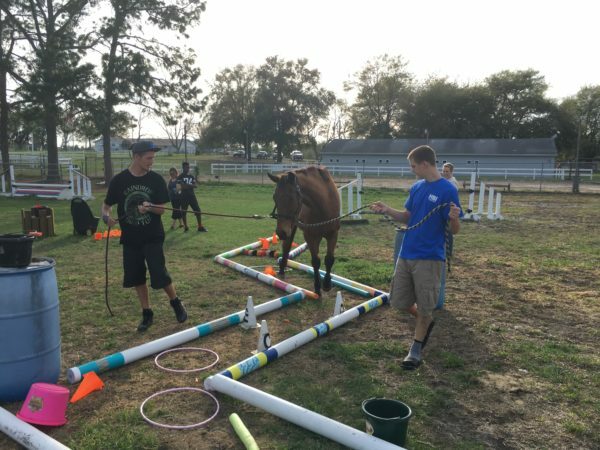 As a non-profit we conduct our equine assisted learning activities free of charge to those in need in our community. Please contact us to learn more. 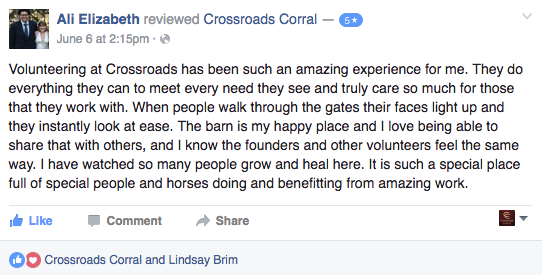 2015 has been a life-changing year for us at Crossroads Corral. This was our first year of operation and we have been able to see our dream of helping others through the use of horses come true! This year has had its challenges and ups and downs but we as a team are motivated now more than ever to continue walking this path to serve. Women veterans who have suffered sexual trauma in the military. This has been brought to our attention as a great need in our community and there is little support provided to these women as they are often overlooked. Sadly, these women have been trained to be silent in their suffering and we want to help them find their voice and heal. Women and children who have been victims of human trafficking. Did you know that Florida is one of the top three destinations for human trafficking? This is happening in our backyard and we must do something to help these women and children to cope with their past and move forward. Our focus will be to promote healthy youth development and help to give them the tools necessary to live a more fulfilled life. Veterans and their families seeking help to transition home from deployment. 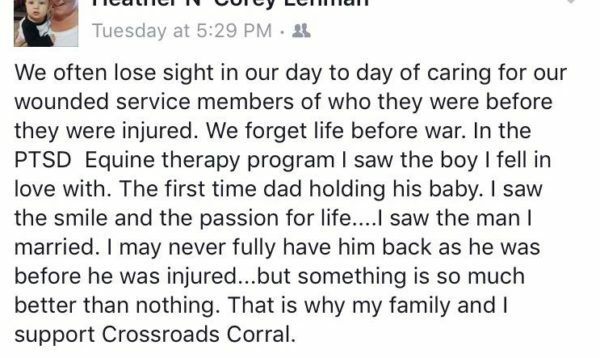 Even though it is typically only one family member who leaves to serve our country, the invisible wounds of war affect the entire family unit. 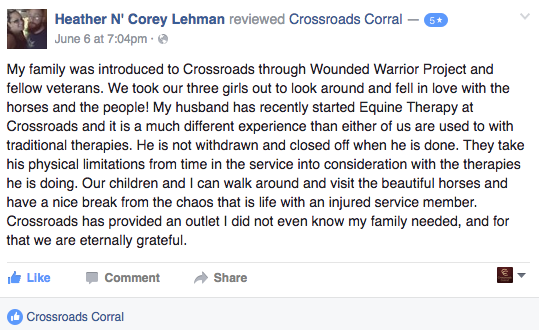 Our focus at Crossroads Corral has always been and always will be on mental and emotional health. We conduct ground based, specific activities to promote positive life skills and self-discovery. We also partner with Mental Health professionals to provide Equine Assisted Psychotherapy as needed. I want to make sure to note that we are not a therapeutic riding facility, which makes us very different from other “equine therapy” programs in our area. Thank you for your continued support and we look forward to changing lives together in 2016! Does your child want a pony for Christmas? It is not uncommon for kids to ask for a pony for Christmas. Why wouldn’t they? Ponies are super cute and easy to fall in love with. 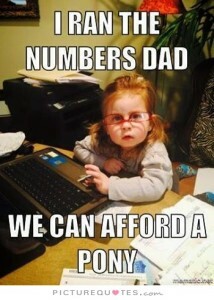 Most people, especially the kids don’t know the work and expense that goes into having your own pony or horse. 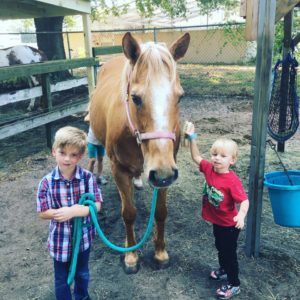 What parents also may not know is that getting your child involved with horses may be easier than you think! 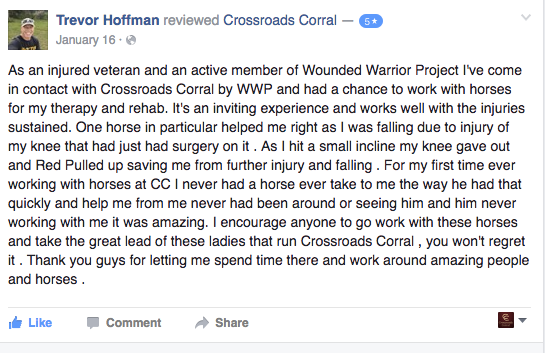 We at Crossroads Corral feel so blessed every day to have our horses. We believe we have been lead down this path of serving others to essentially share them with those who cannot have their own horses for whatever reason. The life lessons and personal benefits that naturally come from working with horses are incredibly powerful. If only people who owned their OWN horses could benefit in this way, there are so many people who would miss out. That is why we have decided to share our gift of horses with our community. 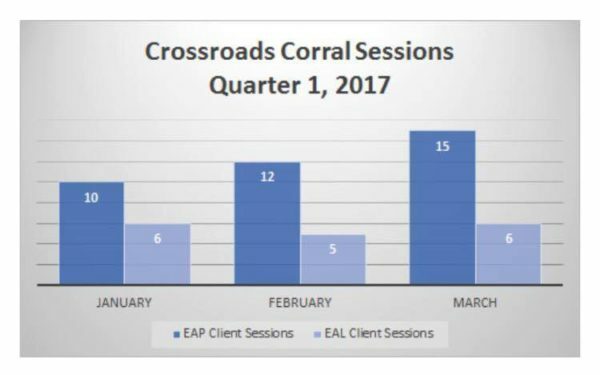 Individual or group EAL/EAP sessions – this is the heart and soul of our non-profit organization. We conduct ground-based equine assisted learning and/or therapy sessions with the horses and our team. The horses are really the teachers and this work promotes positive youth development. Monthly Horse sponsorship – for a minimal donation per month, you would have the ability to spend time with a horse of your choice on the farm. Join our 4-H Club, Corral Life – 4-H is an incredible organization that promotes leadership and positive youth development. Julie and Lindsay are proud to be 4-H leaders in Seminole County.